Adelges piceae has no sexual stages and instead reproduces parthenogenetically on what is assumed to be its secondary host, fir (Abies species). The white wax wool largely covers the immature and adult Adelges piceae. Under the wool Adelges piceae adults are less than 1mm long, blackish-purple and roughly spherical in shape (see first picture below). The adults lay a cluster of orange eggs on the bark beside them (see second picture below). 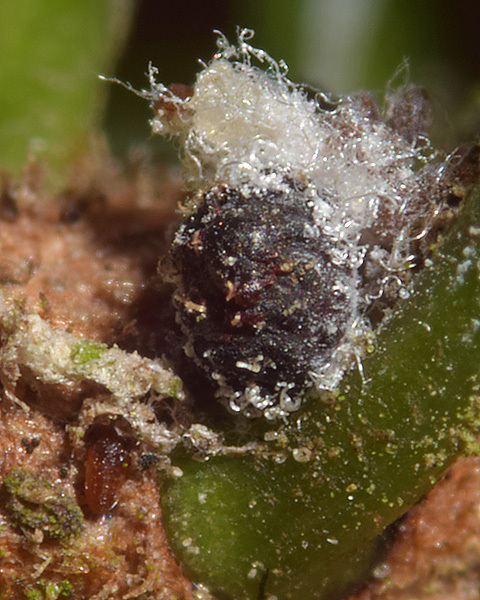 The eggs hatch to give the first instar larva, known as a crawler (see third picture below). The crawler is also orange with legs and black eyes. It is very active for the first few days, but subsequent instars are sessile, and resemble the adult. The stage used for identification purposes is the overwintering stage of the first instar larva of the sistens (= apterous) morph (the neosistens stage). The spinal and pleural sclerites of mesothorax, metathorax and abdominal tergites 1-5 are not fused. 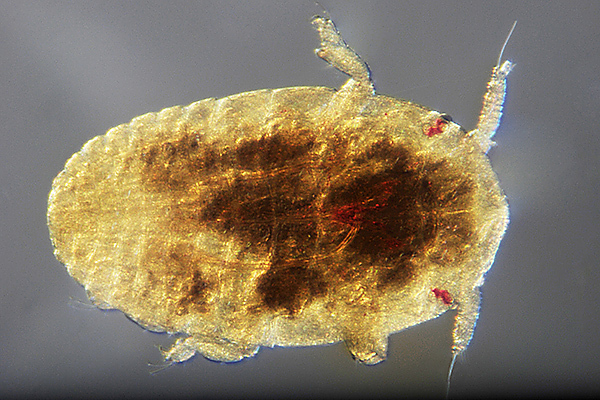 The pleural sclerites of Adelges piceae are without wax glands. The spinal sclerites have well-developed wax pore plates along the inner margins. The wax pore plates on the inner margins of meso- and metathoracic spinal sclerites are divided into 3-4 angular, or rounded, areas. Central areas of wax pore plates on meso- and metathoracic spinal sclerites often more-or-less triangular, each with 3-6 pits. The total number of pits on the 10 central areas is usually less than 40 (but this ranges from 18 to 59). Adelges piceae is anholocyclic, and feeds on Abies species. In Europe, on Abies alba, it is of little economic importance and normally infests the trunk and larger branches of trees between 30 and 100 years of age. In the U.S.A. Adelges piceae is a serious pest of natural fir forests, and the Christmas fir tree industry. Adelges piceae is invasive outside of its native central Europe, from where it spread via timber imports. Adelges piceae is limited in its northern distribution by cold weather, but also occurs in Chile. 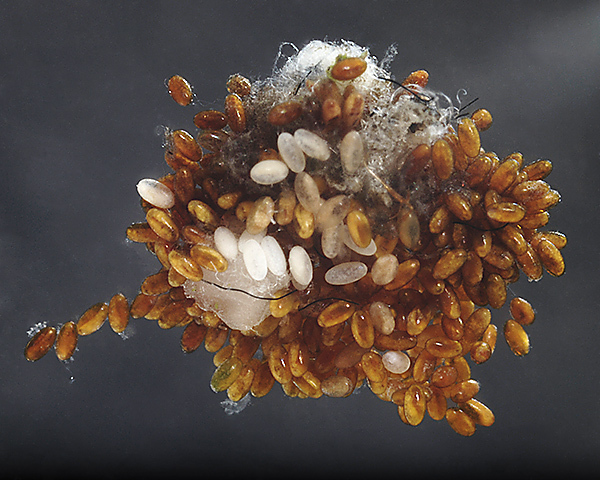 The eggs and newly hatched nymphs are spread by wind, on animals, clothing, vehicles and other equipment. Adelges piceae overwinters as a flattened wax-fringed resting first instar larva known as a neosistens. Growth and development commence during spring. 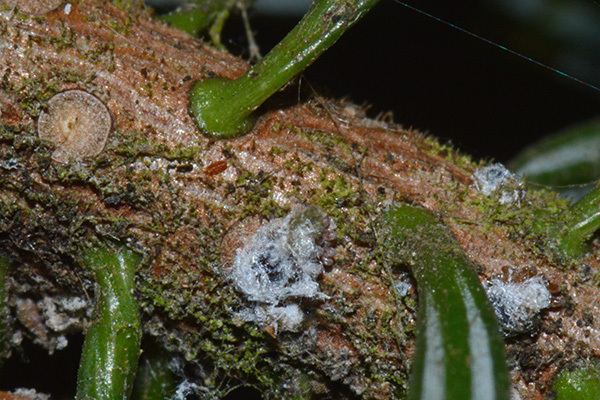 The neosistens mature to the adult sistentes stage by the end of April when they may be noticed as small patches of white wax wool on the bark (see picture below). They lay their eggs in a cluster (average 150 per female) (see picture below) over several weeks next to where they are feeding. 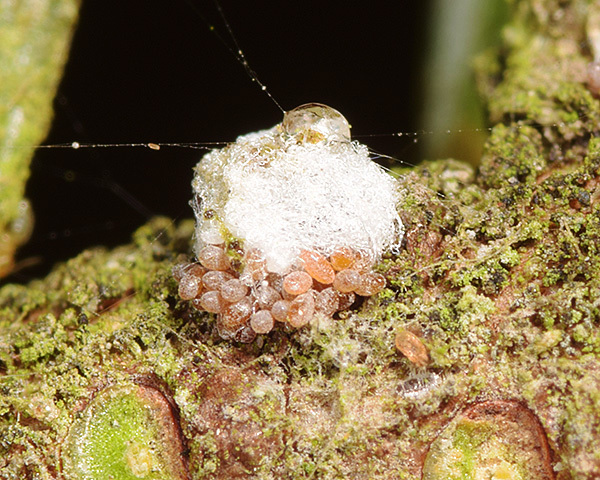 The newly hatched crawlers (see flattened orange larva in the picture below) from these eggs are usually first seen when the buds are breaking and are very active for a few days only as they spread along the branches and twigs of fir seeking new feeding sites. The crawlers from the first eggs that hatch are of the progrediens morph, that feeds on the very young needles (Carter & Winter, 1998). In many places (including Britain) this first hatching is usually a minor event in the life cycle of Adelges piceae because the eggs hatch before the buds have broken, so most of the progrediens-stage perish. If they do manage to find a needle of the right condition, they settle on the underside of the needle and mature to either a wingless form, or a winged form (which has membranous wings, five-segmented antennae and generally lacks wax pores). They then lay eggs, and the crawlers from these eggs settle on stems and twigs to become the next generation of adults. The more usual course of events, for the bulk of the crawlers hatching from the first sistens generation that has overwintered, is to settle on stems and twigs (see picture below) and transform into the neosistens form. By July these neosistens have matured to adult sistentes and eggs are present again, laid in a cluster of 20-40 behind each adult sistens. Usually one further sistens generation occurs, reaching maturity by September, and the crawlers hatching from their eggs can occur up to October. These crawlers settle as before, on the bark of twigs and stems, where they overwinter. The current wide distribution of Adelges piceae in Europe and both North and South America, leads to some variability in the life cycle. The number of generations it has per year varies depending on altitude and summer and winter temperatures, but there are usually 3-4 generations per year. In warmer and more favourable sites the rate of growth, rate of oviposition, and duration of diapause may be significantly altered so that additional summer generations can occur. The ecology of Adelges piceae in North America is considered in greater depth by Hain (1998), whilst Varty (1956) covers much of the earlier work in Europe. 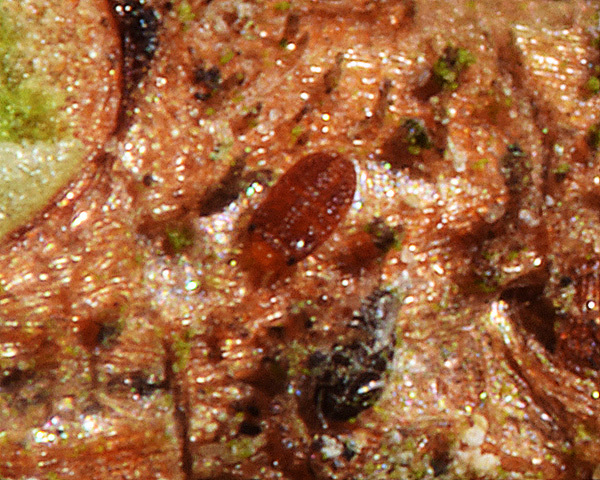 The primary host of this adelgid, if such exists, is unknown - Adelges piceae is only known to reproduce parthenogenetically, on what are presumed to be its secondary hosts. Adelges piceae has been recorded from at least 19 Abies species. Blackman & Eastop list 47 species of aphid as feeding on true firs (Abies species) worldwide, and provide formal identification keys. The list includes at least 30 Cinara species, and all Adelges Dreyfusia species. A common symptom of Adelges piceae attack on North American firs is 'gouting'. The terminal growth is stunted with distinct swellings around the buds and branch nodes. Trees with this kind of injury decline slowly and it may take some years for the tree to die. A more serious type of attack is mass infestation along the main trunk. Very high densities may be reached and the foliage of the dying tree turns yellow and then deep red or brown. This latter sequence is most common with infected balsam, Fraser and sub-alpine firs. Trees may die quickly after 2 or 3 years of heavy infestation. The damage described above results from the insect secreting an irritating, salivary substance that elicits a defensive response from trees where the adelgid is not native. The substance causes abnormal cell division and differentiation in the bark and newly formed wood. The principal injury associated with stem infestations seems to be obstruction of the water-conducting (xylem) tissue. But some decline is probably related to obstruction in the phloem tissue, which has an important role in transporting and storing food. Stem attack results in the formation of dense compression-wood, reducing the quality of the wood fibre that is used in pulp and paper manufacturing. Prolonged shoot-attack will hinder bud growth and height growth. Tree vigour declines as photosynthetic function decreases and foliage is lost. No new needles replace those that are naturally shed. This ultimately leads to top kill and mortality of the whole tree. 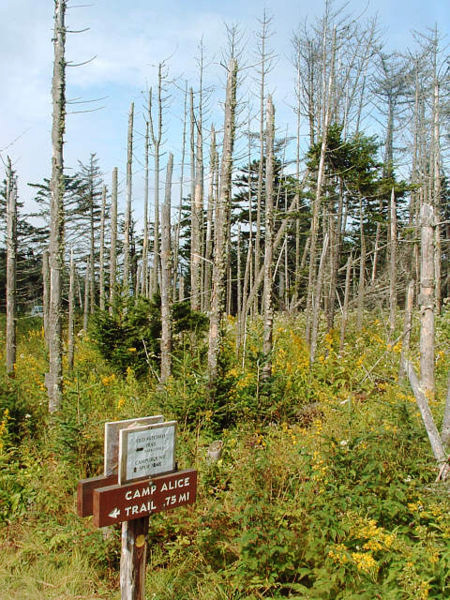 Infested Balsam and Fraser firs may be killed in only 3 to 4 years. North American hosts are so sensitive to attack that the damage seems out of proportion to the insect's size and method of feeding. Billions of feet of fir timber have been destroyed by Adelges piceae in North America. It is a serious pest to seed production, landscape fir, natural fir, and fir Christmas tree industry. 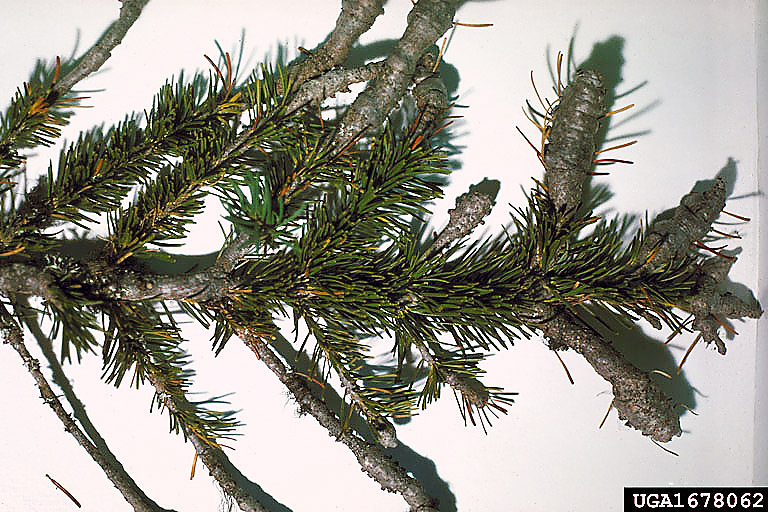 Attempts to control Adelges piceae have generally been unsuccessful, and the U. S. Fish and Wildlife Service listed the Fraser fir as a species of special concern. The massive decline of Fraser firs has also placed plants and animals of the spruce-fir plant association in jeopardy. The susceptibility of firs to attack ranges from highly sensitive to resistant, with North American species being the most sensitive to attack. European firs, especially European silver fir (Abies alba), support large adelgid populations, and yet remain relatively unharmed. Asian firs seem intermediate in sensitivity; some are damaged and some are not. Further information on the damage caused by Adelges piceae, and methods of control, are given by Ragenovich & Mitchell (2006), and the Invasive Species Specialist Group (2015). Hain, F.P. (1998). The balsam woolly adelgid in North America. pp 87-109. In: Ed. Berryman, A.A. Dynamics of Forest Insect Populations: Patterns, Causes, Implications, Plenum, New York.